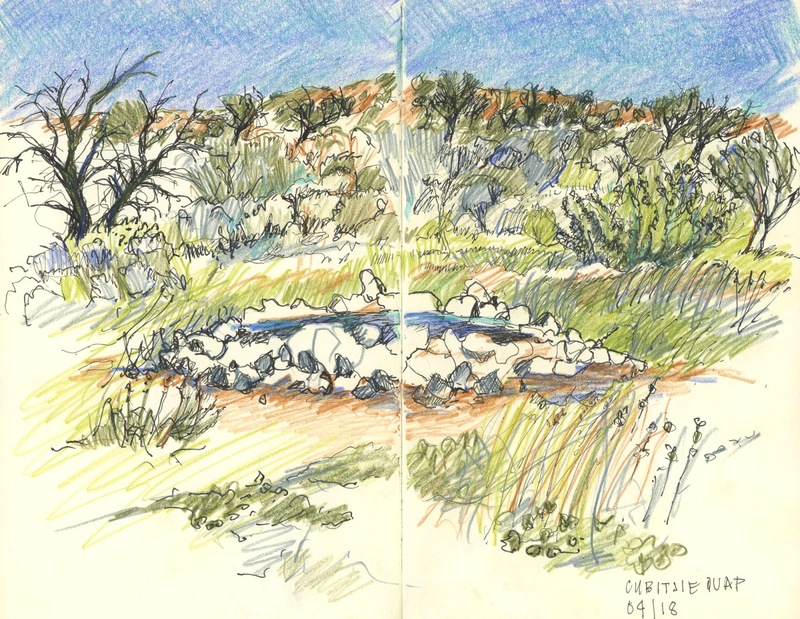 tanja wilmot illustration: Meditation notes - drawing in the Kalahari. 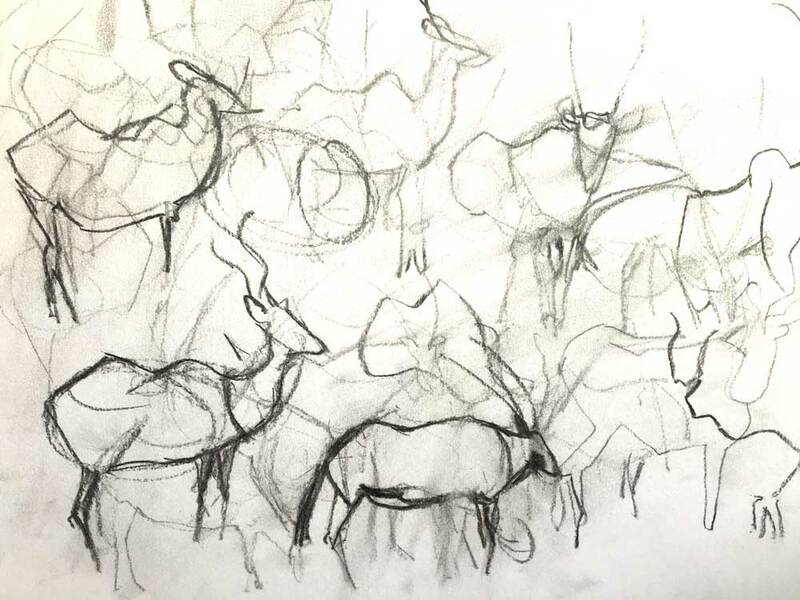 Meditation notes - drawing in the Kalahari. Here's a drawing made in the shelter of a cool, shady bird hide at Nossob, a camp deep in the Kgalagadi Transfrontier Park, some 200 km outside Upington on the SA/Botswana border. The hide has a view onto an expanse of veld and waterhole a few meters away. In the heat of the afternoon, there's just the soothing cooing of doves, perhaps occasionally the snap of their tiny wings as a flock takes to the air as one when the resident falcon swoops. Drawing in the silence of the hide invites simplicity. 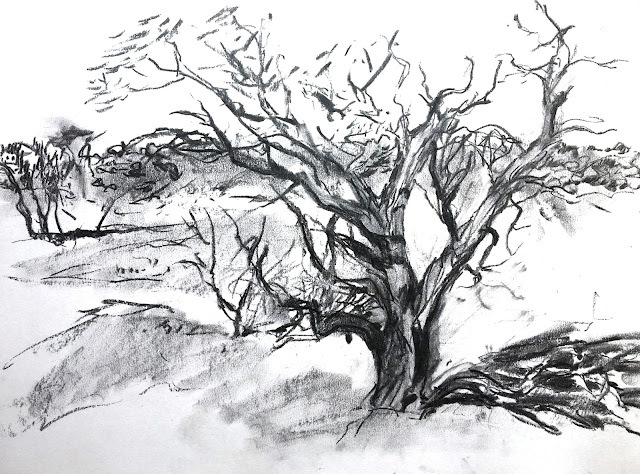 The tree up ahead, the play of light and shade, soft scrunch of charcoal on paper, I'm content to just record this meeting of hand, eye and world. It's a kind of simple that actually takes a lot of hard work to trust as internal scripts play, unbidden. 'What is this for? Is this good enough? This composition isn't right. This isn't going to work out. This branch isn't right. I've got the angles all wrong. I'd best stop now, I don't do landscapes anyway'. Ah, anyone who has listened to their thoughts for even one minute while drawing will most probably recognise these thoughts. On and on they play. The trick is to just let them come, and keep drawing anyway. As in meditation. Thoughts arise, sheer delight! Pema Chodrun. Another drawing at a waterhole. The beautifully named Cubitjie Quap. This time I was drawing in a car, a sarong tucked into a window to shade us from the hot-even-in-March sun. The meditation of a nothing happening waterhole. In an hour, not much happened. A jackal came to drink from one of the silver puddles on the dirt road behind us, but other than that, no beasts. It had rained well previously so the animals didn't have such a need for the waterholes in the otherwise arid park. Just the breeze, the dunes, the jewel colours of the tiny resident seed eating birds. Sheer delight. There were times for watching and photographing animals too: lion, an elusive leopard, bright yellow cobras and even a very sweet looking long tailed tree rat, though I drew antelope mostly. 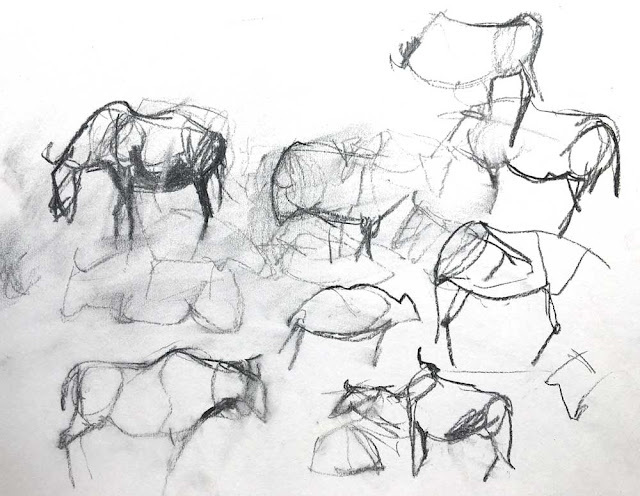 I'm not a super seasoned animal sketcher, and it felt tricky to draw animals in a grazing herd, since they shift constantly, checking the breeze, nuzzling one another out of the way, turning this way and that. I gave up on a perfect drawing of any one of them. Instead, sketching out in the veld turned out to be about applying lessons in confidence from my regular life drawing class. To commit lines rapidly, to keep looking, keep drawing, to keep trusting that eventually something instinctive will show up on the page. I wipe the page clean with my hands and start again, draw another layer, keep feeling my way, keep going in spite of the feeling of failure. Until it got too hot in the car, and the flies that accompany grazing herds (and evidently, game viewers in their cars) got too much. That and the thought of a cold drink under a thorn tree back at camp, the evening braai fire. Perhaps my perfect antelope drawn from life is many Kalahari trips away, but for now, these drawings feel like progress. Like enough. I'm grateful for the privilege, grateful for the experience and glad I gave it a confident go.